It’s no secret that floors take a beating whether you have children running around or just from daily activities. If you are tired of watching your hardwood floors slowly lose their charm, we have news for you! Now you can get back those fresh floors without having to remodel. Keep reading to find tips to to help keep your hardwood floors looking lovely for a long time. Sometimes all your floors need to remove years is a professional cleaning. Being able to remove deep dirt without scratching the surface. Use a hardwood floor cleaner regularly to clean your hardwood floors. Be sure that the product you are selecting is specific for hardwood floors, other floor cleaners can be harsh and remove the finish. You may also want to use a polish to add a layer of protection from scuffs. No matter if your hardwood floors are matte or high-gloss, switching to a different sheen can help older floors look brand new. Using a fresh topcoat can give you a new finish and transformation you have been looking for. Staining your current hardwood floors is another great way to revive the floors you have. Adding a whitewashed hue to your hardwood floor can give a relaxed and airy vibe. If you are trying to stay classic, you may like a medium brown and even gray for a modern look. Keep your home color scheme in mind and have fun with color! The natural grain patterns in wood are part of what makes hardwood floors so beautiful. Using a natural oil on your hardwood floors can bring out the grain in each plank. If you are visualizing texture in your floors but don’t have the money to buy new floors we have the tip for you! Consider hiring a professional to wire-brush your floors. This removes the soft grain and brings in a hard grain appearance. 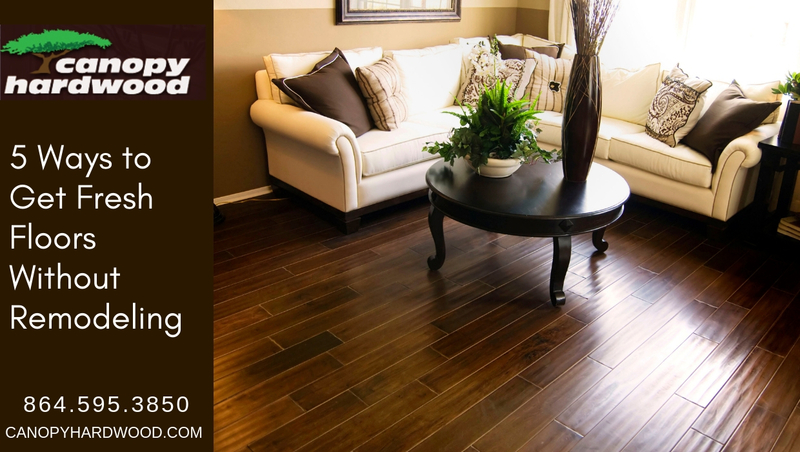 Email or call us today at (864) 595-3850 to discuss your flooring options.